One of the complaints some fans have leveled against this line is that while there are many characters who appear larger in the cartoon, such as Dogpound and Leatherneck), they've been scaled down a bit for the toy line. While I'm never too thrilled about toy lines arbitrarily changing the scale of characters, I do understand why Playmates did this: it makes sure to keep all the characters at the same price point. Playmates has shown a bit of innovation, however, by having some characters need a bit of assembly. Snakeweed is one of those character, so in order to make him fit nicely in the standard blister card you'll have to assemble his legs and antennae. While he doesn't stand fully erect, he still manages to stand right around 6 1/2 inches from the bottoms of his feet to the tips of his antennae, so he at least towers over the Turtles. He's sculpted in that fun, wacky style that defines a TMNT figure and will fit in with not only the new TMNT lines, but probably any of your older TMNT lines, too. The TMNT figures have been all over the place in regards to articulation. Some have been excellent (all of the Turtles) while others have been fairly limited. Snakeweed actually steers more towards the good than the bad. 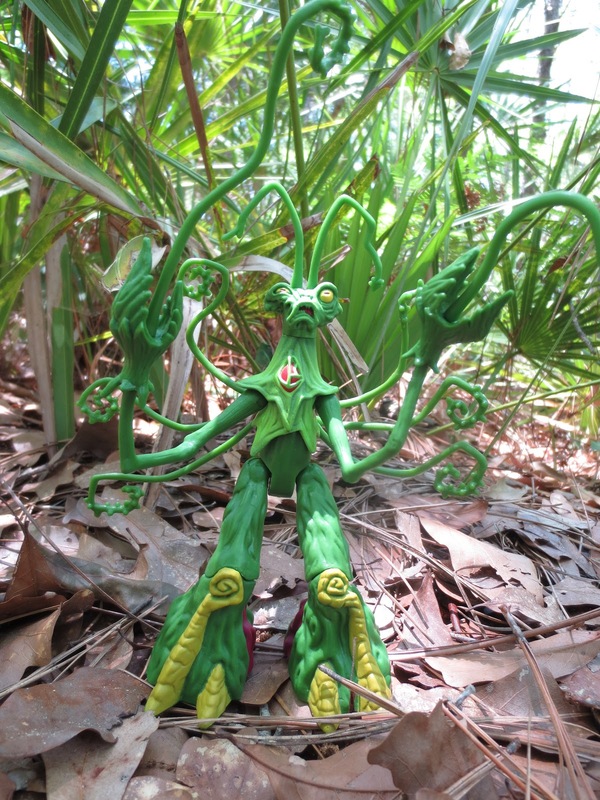 He features: hinged knees, ball jointed hips, a mid torso swivel, ball jointed shoulders, swivel claws, each with a swiveling vine protruding from them, a swivel neck, and swivel antennae. 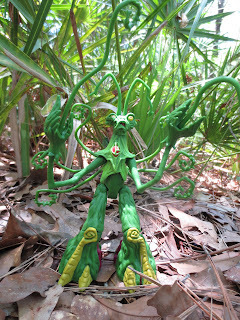 While he's not superarticulated (partially due to his odd body structure) he does have some decent joints that make him more fun to play with and give you a bit of flexibility for display or photo taking. Every seems nice and tight with good quality control. 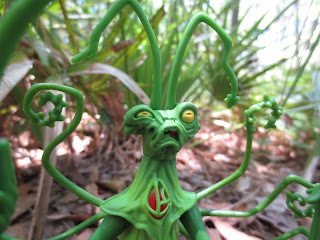 The character design and sculpt are what truly help Snakeweed to succeed and excel as an action figure. 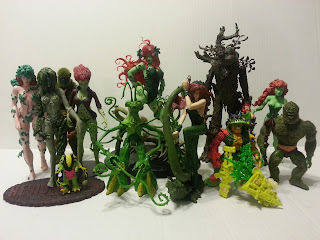 I really like plant based characters for some reason, so perhaps that helps Snakeweed gain a few more points in my book. First, I gotta point out his head sculpt. The delightful grimace on his face pairs so well with the uneven eyes (one squinting, one bulged open) that you can't help but like this fellow. 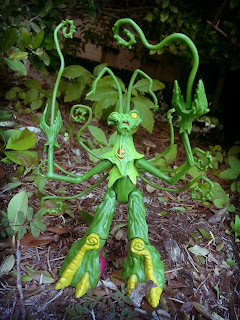 The unique body shape with the eight vine arms (six of them are not at all articulated) gives him an interesting appearance that feels very unique. While the vines are all smooth, the ends curve into little hooks covered with thorns. His feet (I guess that's what they are) have a very interesting look that reminds me of some of the Swamp Thing figures from the old Kenner line. They look very organic, almost as if they're been rooted to the ground. I can't say enough how much I like the look of Snakeweed. He's really a very fun character design. While most of the figure's color is derived from the green plastic he's molded in, Snakeweed does have a few paint apps that give him a bit of color. The feet and thighs actually have a fair amount of paintwork that gives Snakeweed some unique coloring. The fuchsia and yellow help him to look like a more organic being who has perhaps risen right out of the earth. The torso is a lighter green and nicely breaks up the figure. There's some type of red orb in his chest (must be his weak spot!) and he also has bright yellow eyes. While the green plastic shows through the yellow paint, it looks OK on this guy. Nothing amazing, but enough to give him some character. While Snakeweed doesn't come with any traditional accessories, he does come somewhat disassembled in the package. Both of his lower legs, his antennae, and the two long vines that are protruding out of his Venus flytrap like hands come unattached. While the lower legs are meant to be attached one time, the vines are easily removable and could function as accessories if you pretend that they pop in and out of his hands. Like the rest of the vines which are permanently attached to his body, they are green and feature various points on the ends. My biggest complaint about this line is that lack of cool accessories in some of the non Turtle characters. Teenage Mutant Ninja Turtles figures have always had some of the coolest, craziest accessories around, so it's a shame to see nothing extra included with Snakeweed. While he doesn't come with any traditional accessories and has limited paintwork, he does have a brilliant design and some decent articulation. It's due to the strength of the character design alone that I'm giving Snakeweed a Good and a half. He's just so interesting and unique that I find myself over and over picking him up to fiddle around with or to take a few pictures of him. He won't be everybody's cup of tea, but if you're looking for a good villain to add to your turtles collection, this is definitely a good option. I've reviewed most of the basic TMNT figures on Amazon, but the only other TMNT figure I've reviewed here on The Epic Review is Ooze Tossin' Raph. Barbecue17 hates snakes and he hates weed. Winners don't use drugs! He spends a great deal of time on his Flickr account posting toy related pictures.